Rinse the farro, and bring 2 1/2 cups of water to a rolling boil in a medium saucepan. Stir in the farro. Reduce the water to a simmer and cover the pot. 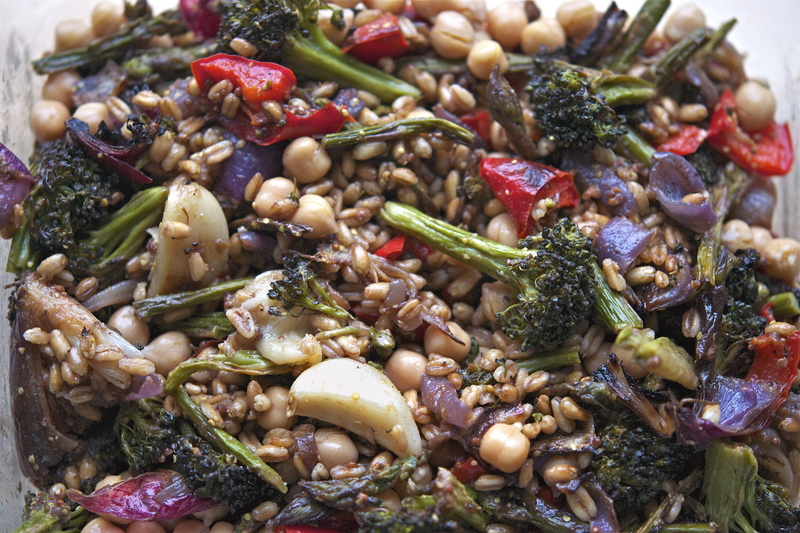 Allow to cook for 20 to 30 minutes, or until the farro reaches desired texture. Drain any excess water – set aside to cool. Preheat your oven to 400 degrees F. Place all of the cut vegetables and the whole garlic cloves into a large mixing bowl. Toss with salt, pepper, and caraway seeds. Spread onto a heavy baking pan, then set into the preheated oven. Roast for 20 to 30 minutes, or until the veggies are browning around the edges. Remove from the oven and allow to cool. Meanwhile, place the mustard, honey, sherry vinegar, olive oil and thyme into a small jar with a lid – shake vigorously to emulsify the mixture. Once the vegetables are cooled, toss with the farro and garbanzo beans – add desired amount of vinaigrette, and stir to combine. Season with salt and pepper to taste. (Note – will keep for several day refrigerated). To read more about this dish and my musical pairing, click HERE.